Sight is one of the most precious of our five senses. It is vital to almost everything we do! That's why your visual health is so important! That’s what IGARD is all about. IGARD stands for Improving Eyesight and Guarding Against Reading Difficulties. They have a strong commitment in restoring and remediating the vision of children and adult who face challenges in reading. 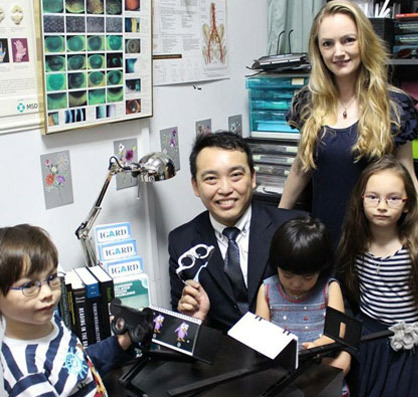 The team in Singapore attends to a wide variety of cases ranging from routine eye examination and specialized work on vision therapy, behavioural vision, low vision, neuro-optometric rehabilitation and paediatric optometry. Optometrists are the visual health specialists. They typically work in a primary care or community level (and even at the highstreet shopping centres!). Besides checking your eyes, they manage visual defects and/or visual health deficiencies. They are experts in prescribing spectacles and/or contact lenses and checking your eyes for abnormalities and/or early-stage diseases that could potentially affect your eyesight. Some optometrists also work at tertiary healthcare level together with ophthalmologists (or ophthalmic surgeons) in hospitals to care for patients suffering from eye diseases and/or visual impairment, while others work in vision science and clinical research. Patients who have been discharged from the hospital often also need post-surgical follow-up with optometrists. As primary eye-care providers, optometrists will usually screen patients for early-stage eye diseases. This is especially important as many early-stage problems typically do not show any symptoms. Early treatment can prevent permanent deterioration of sight. There are also optometrists who specialize in specific areas of clinical optometry such as vision therapy, orthokeratology refractive therapy, contact lenses, low vision, binocular vision (orthoptics), behavioural optometry, paediatric optometry, geriatric vision, occupational vision and neuro-optometric rehabilitation. Optometry is an integral part of the world’s healthcare system and optometrists may either work independently or work closely together with other professionals in allied-health. The IGARD Group is enthusiastic and passionate in optometry and takes pride in delivering primary eye care and specialized visual health services. Vision problems need not always be due to the eyes -- it can be argued that it is the brain that does the 'seeing' (perception) and the eye is a neural extension from the brain that detects light. Therefore, lesions in the brain or the neural pathway linking the eye to the brain can result in characteristic types of visual field loss, which may be detected during an eye test. The commonest visual problems are short-sightedness (myopia), long-sightedness (hypermetropia) and astigmatism, where good vision may be restored through the compensation using spectacles, contact lenses or refractive laser surgery. However, some visual defects, in particular high myopia, may be strongly associated with serious potentially blinding eye diseases, such as retinal tears, detachments, cataracts and glaucoma. The full training of optometrists worldwide is generally between four to six years. In the U.S., optometrists must complete a four years postgraduate programme that leads to a Doctor of Optometry (O.D.) degree. In the U.K., optometrists has to pass a Professional Qualifying Examination, a one year internship and complete a 3-4 year Bachelor of Science degree course in Optometry. In Australia, the Bachelor of Optometry/Bachelor of Science programme is generally between 5 to 6 years. Optometrists in Singapore may be trained overseas or locally. Under local regulation, optometrists in Singapore has to either hold a diploma or a degree in optometry. Generally, diplomas are conferred by local polytechnics and a private institution, and degrees are conferred by foreign institutions through distance learning courses or institutions with partnerships with foreign universities. There are three schools of optometry in Singapore that leads to a Diploma in Optometry. They are Singapore Polytechnic’s School of Life Sciences, Ngee Ann Polytechnic’s School of Health Sciences and Parkway College of Nursing and Allied Heath. In partnership with Salus University’s Pennsylvania College of Optometry, the Singapore Optometric Association also runs a degree programme leading to a BSc in Optometry and MSc in Clinical Optometry. In the past, the Singapore Polytechnic has also partnered with the University of Manchester to offer a course leading to a BSc (Hons) degree in Optometry.